Here's The Guy Who Bailed Out Annie Leibovitz! Bloomberg digs to the bottom of how Annie Leibovitz survived her brush with death Art Capital last summer. The short story is that she found someone else to bail her out. 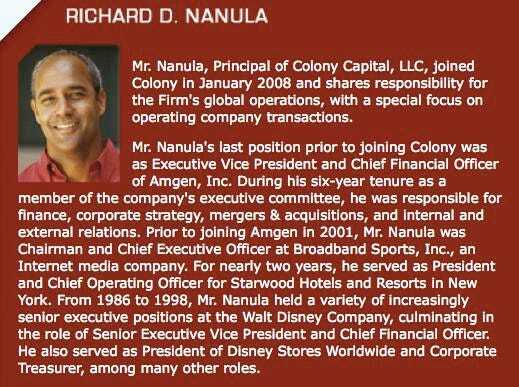 That someone was Richard Nanula of Colony Capital. Richard used to run Starwood, among other things. Now he’s make a (presumably very good) living bailing out flaky artists. Late last summer, Richard Nanula, a principal at private-equity firm Colony Capital LLC, met celebrity photographer Annie Leibovitz in New York as she was struggling to repay a $24 million loan. Nanula told Leibovitz that the Los Angeles-based firm, which is owned by billionaire Thomas J. Barrack, had some ideas about resolving her problems. “I said, ‘We helped Michael Jackson. We’d be happy to explore something with you. We are OK with complicated stuff,'” Nanula said in a telephone interview.On March 8, Colony settled Leibovitz’s debt with her creditor, Art Capital Group, and announced “a new partnership” with the photographer, Nanula said. Colony, Leibovitz and Art Capital all declined to give details of the new contract. Of course, Richard’s not a not-for-profit, either. Which means Annie’s got some photo-selling to do.